Hello gorgeous Lulu Art fans! 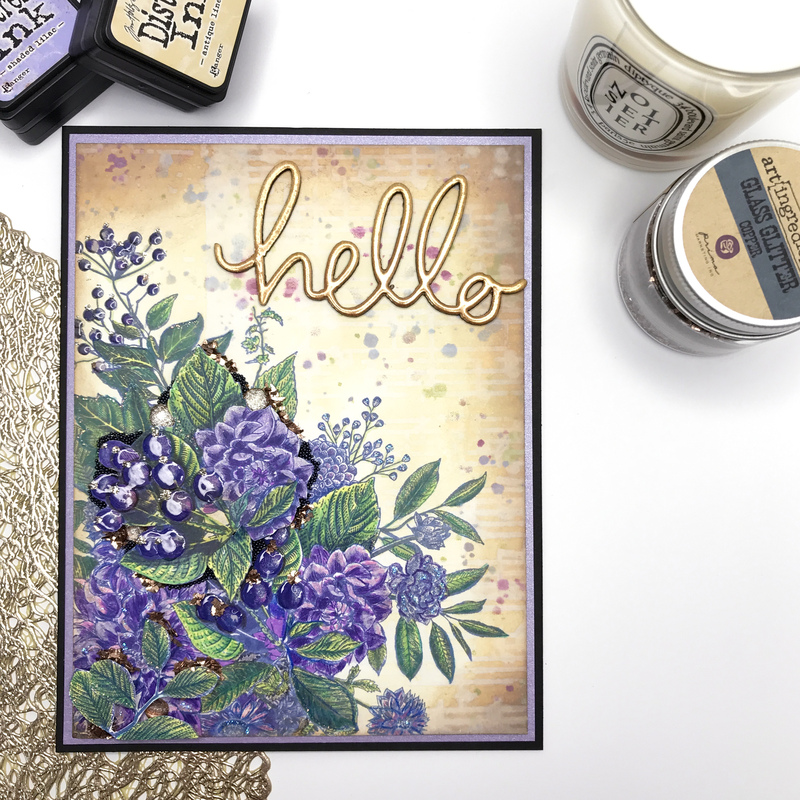 Today I’m going to show you how to make this super pretty card that uses just one stamp, plus a bunch of beautiful products and techniques to really turn it into something special. I’ll be combining products from Ranger, Tim Holtz (Stampers Anonymous) and Jane Davenport and I can’t wait to show you how to make this for yourself. I’ll show you quickly how I coloured the flowers, but what I really want to show you is how to create that yummy vintage toned background! 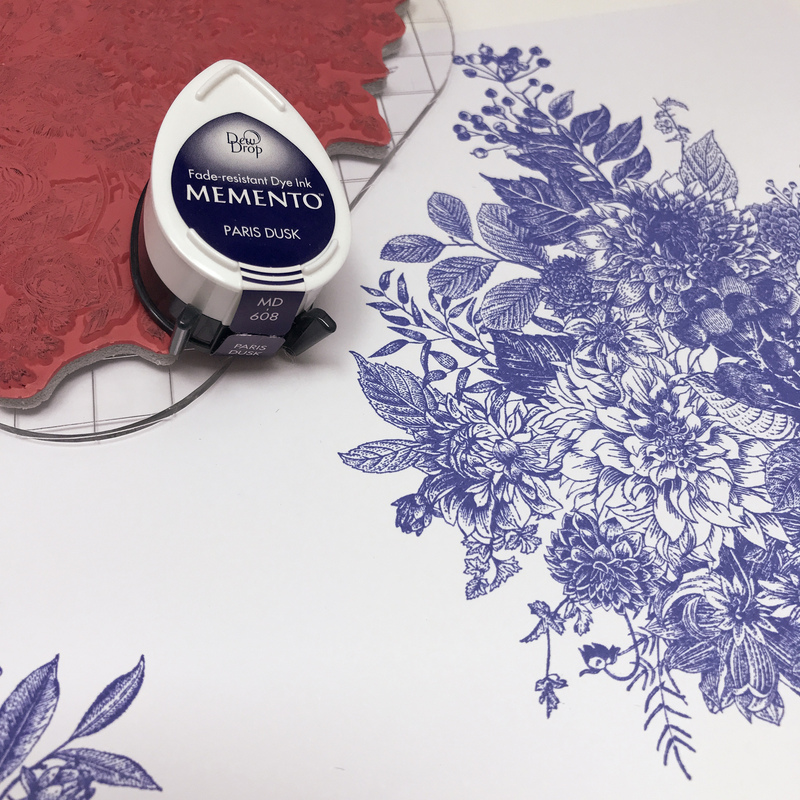 Start by stamping the large Glorious Bouquet stamp onto XPress-It Blending card using Paris Dusk Memento ink – stamp 2 images – one as the base and one to cut up. Color Images using Alcohol ink markers I used colors from Jane Davenport. Keep the coloring simple, the stamp is very busy so you will need to use what’s already there color-wise as a guide and leave lots of white space on the flowers. I used a very simple beginners technique – layering colours. Start with the lightest colour all over, then add mid tones and finally your darkest colour just where it’s darkest on the original stamped image. You can see this in the video below. This is the step where your card becomes to come together and take on a real old world vintage feel. Begin by cutting the card background to size and then create a border by adding Archival ink in Pale Ochre over a stencil – just around the edges – using archival ink means this particular colour and design won’t budge! Add Antique Linen Distress Oxide ink over all the white areas of the background card using a foam applicator – you can even add this over the smaller flowers (very lightly), then add a little of the Antique Linen Distress Ink (just to darken the colour), once the white space is filled in then use a darker Distress ink (gathered Twigs) to edge the card. Add a little colour to the background using Distress Oxides in Seedless Preserves, Peeled Paint, Antique Linen and Shaded Lilac through the splatter stencil – add one colour at a time. Spritz the music note stencil with water and then press the wet stencil over your coloured card background, leave for a few seconds. Then blot the card with a paper towel to remove the water and reveal the bleached design. Next use Jane Davenport Magic Wand pencils to add depth and dimension to your stamped and coloured images by adding color to the white areas and black (or dark blue) to the shadows. This will help lift some of the designs from the background and make other sections fade to the back. Use double-sided foam tape to add the cut out flowers and leaves on top of the stamped background. Finish the card by mounting onto coordinating colours of backing card, add mini beads and a little glitter (stickles or Finnabair) and add an embossed chipboard word. When the stamped design is this busy it’s best to keep the embellishments simple. This entry was posted in card, Design Team and tagged Kate Palmer. Bookmark the permalink.